On our second-to-last day in Las Vegas, we'd done the predictable: eat at celebrity chef restaurants and a buffet. Yah, not exactly the way I'd choose to do things. So I ended up appealing to everyone's desire to eat something more simple and less heavy (relatively). 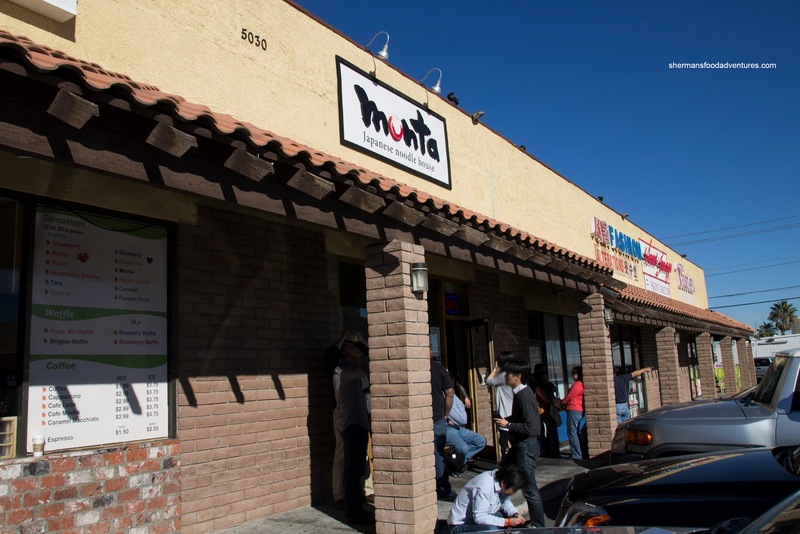 I suggested we hit up Monta out on Mountain Springs Road for some ramen. Sure, it wasn't exactly close to the strip, but I was able to round up Vandelay, Chill and Costanza into sharing a cab out there. Upon our arrival, we were greeted by a substantial lineup - a very good sign. The food had to be good right? Well, and the fact the place makes a take out pizza joint look large. Since eating a bowl of ramen usually doesn't take very long, we were seated with a brief wait. 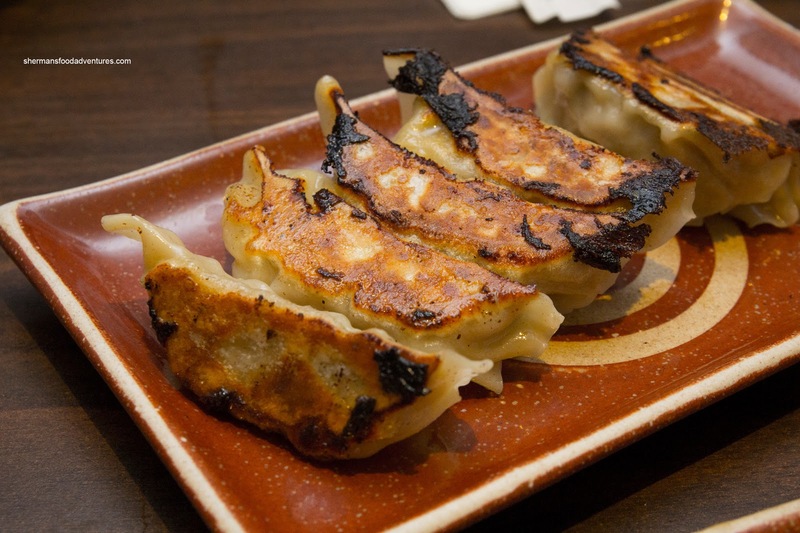 We started with 2 orders of Gyoza which were fried up beautifully with a dark shade of brown. The bottom was crisp while the rest of the dumpling was soft and airy. I found the filling to be a little heavy on the greens, but it was not gritty and was light. For myself, I had the Tonkotsu Ramen with add-ons including corn and nitamago. 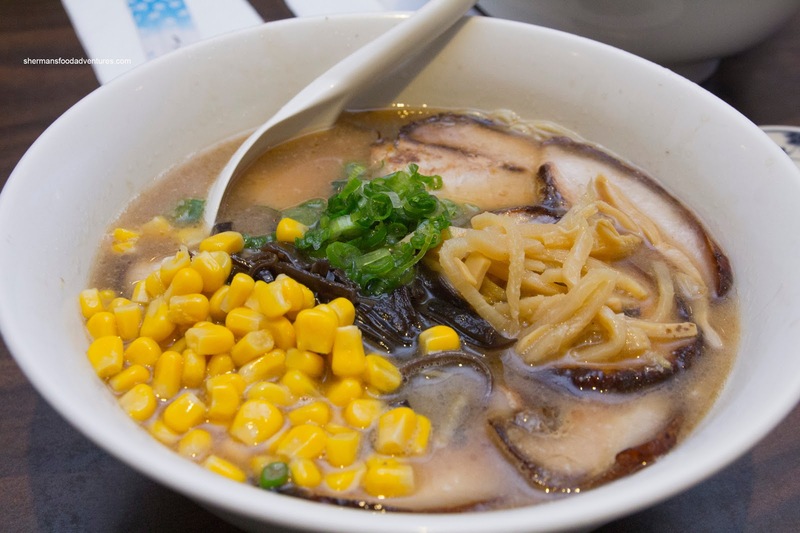 I found the portion to be modest with a broth that was silky, rich, nutty and super flavourful. It wasn't salty per se, but I'm curious if they added any MSG because it was that impactful. On the other hand, it could've been from the pork fat and/or addition of butter. It reminded me of a slow-boiled chicken feet soup (if you've had this, you would know what I mean). It took a while for me to figure it out, but it hit me while I was walking back from Walgreens and burped (from the Pepsi I was driniking) up the taste... TMI??? The thin noodles were still al dente and had soaked up plenty of the broth's depth. The chashu was cut thin, fatty and completely melted in my mouth. As for the egg, it was nicely runny in the middle. Chill and Costanza decided on the Tonkotsu-Shoyu Ramen which was predictably less rich than the one I had. 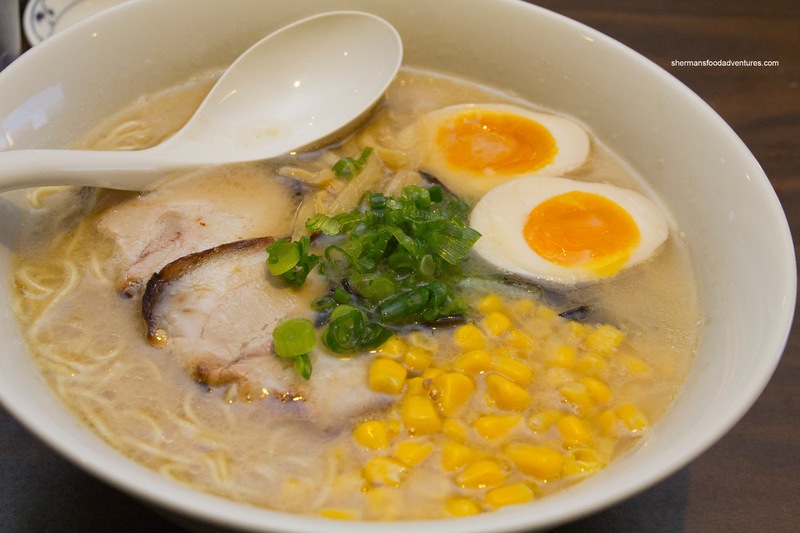 With the mix of chicken and pork broths, it was lighter, yet still very sweet and savoury. In addition to my bowl of noodles, I had a Mini Pork Belly Bowl. 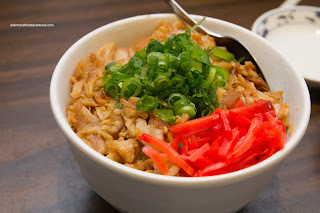 It was fairly large for a small bowl with lots of the same fatty pork belly on top. Due to the plethora of toppings, each spoonful was full of richness and flavour. The butteriness of the pork made it for a luxurious and sinful bowl of rice. 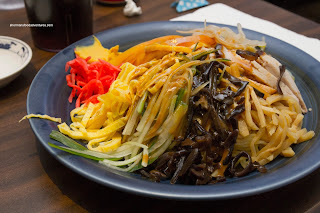 Vandelay went for something different in the Hiyashi Chuka with sesame oil dressing. The noodles were nicely al dente with lots of bite. There was a good amount of ingredients and probably too much dressing. Since the noodles were not pre-tossed in the sesame dressing, there were clumps here and there that totally overwhelmed in flavour. Yet, it was still a very tasty plate of food. Overall, everything we had was executed well and tasted great. We could see why the place is so popular. In fact, out taxi driver stated that many Japanese tourists visit the place as well. He was telling us this while running a red light and cutting off every car in sight... 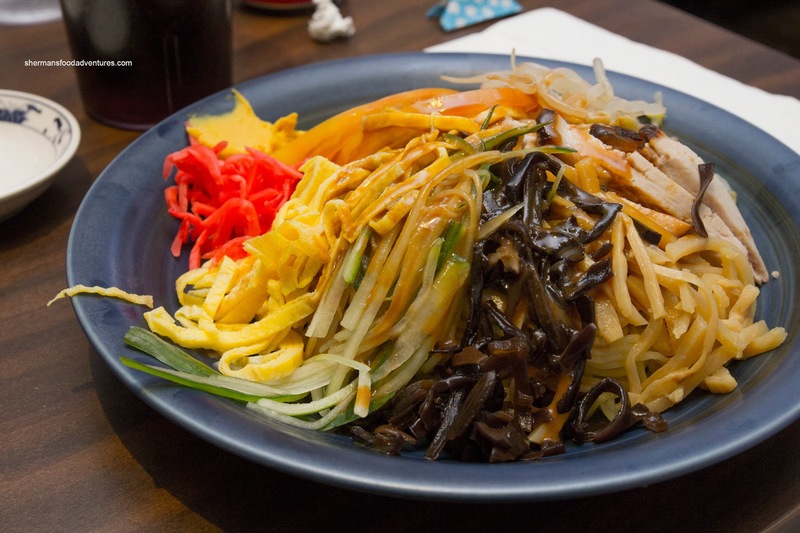 Awesome, great noodles and go karting all in one experience. - I was really thirsty afterwards, MSG? I wish I'd had the chance to advise you on a place I lucked out on there ... a true triple-D experience. I was in LV a couple years ago for a conference. I am NOT a LV-type person and I'd had my fill of the casino atmosphere, so I jumped on a city bus going north on the strip. At the top end, by the Stratosphere, hidden behind a Dennys in a converted gas-station, I spotted a goodly crowd of happy eaters at a place called 'Tacos Mexico'. I wasn't hungry, but something made me get off the bus at the next stop and check it out. Well, it is the real-deal ... a ridiculously good deal actually. For five bucks and change, I got 3 tacos, chips and a drink. The toppings table had a decent selection of sauces and veggy/pickly things. For the tacos, I had tongue, pork and beef. A good way to describe my experience is to say that the place felt really authentic. In dramaticly stark contrast with the rest of that city! It is gritty, even divey, but honest flavours and a straight-up delivery. Sorry this advice is too late for you this time, but maybe next time! @Charlie Van Thanks for reading! Yes yes, I really appreciate the advice! Next time I go, it'll be with a car I'm sure and I'll check out more out-of-the-way joints. I like authentic Mexican food, unlike the Tex Mex stuff we normally get. And yes, I've had some things that I have no clue what it is. I guess if you don't try it, you won't know if you like it or not!